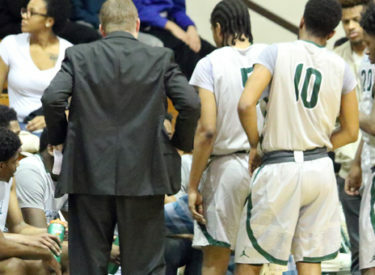 The Seward County Saints couldn’t come up with enough defensive stops to defend their home floor Saturday night in the Greenhouse, falling 99-88 to visiting Butler to drop their seventh game in their past eight outings. The Saints didn’t get off to a particularly good start Saturday night, falling behind Butler 10-4 to get things going, but Seward recovered, coming back to tie the game at 12 on a bucket inside from Charles Beauregard with 12:50 remaining in the first half. Seward took a seven point lead at the 7:44 mark as Beauregard nailed a three and Tre Kidd scored four straight to make it 27-20, but Butler heated up from there, scoring 27 points in the final seven minutes of the half to erase the Saints lead and take a 47-43 lead into the break. Butler connected on 11 of their last 15 field goals of the half to shoot 50% after a slow start while Seward hit on 40% from the field in the period. Kevin Sims led all scorers with 14 at the break while Kidd dropped in 12 for Seward. Seward cut it to a one point game early in the second half at 48-47 after a pair of Beauregard free throws, but Butler steadily grew their lead on the Saints, opening up their first double digit advantage of the game 3:45 into the half at 59-49. The Grizzlies pushed their lead to 14 midway through the second half, but the Saints kept clawing. Seward cut their deficit back to 10 on a three point play by big man Martavious Wilson, but an 8-2 run after that, all but put the game away for Butler as the Grizzlies opened their biggest lead of the night at 88-71 with just 3:41 left. The Saints closed the distance in garbage time late, but in the end, ran out of time as Butler walked away with a 99-88 win to send Seward to their fourth straight defeat. The Saints finished the night at 43% shooting and 44% from downtown, but Butler shot 60% over the final 30 minutes and 52% overall to come out with the 11 point win. Sims led Seward with 26 in the losing effort while Beauregard had 15. Seward drops to 6-13 overall and 3-12 in conference play with the loss, dropping them into a three way tie for last place in the conference standings at nights end. It marks the Saints worst start since the 1982-1983 season. Butler improves to 12-5 overall and 9-5 in league action, keeping in the thick of things in the league race. Next up for Seward is a long road trip to Concordia on Wednesday where they will take on the upstart Cloud County Thunderbirds in Bryant Gymnasium in a 8:00 tip.